Short stories entwined make for an empathetic and emotional narrative! Blurb: When it happens to you, you will be surprised. That thing they say about how you knew all the time, but just weren’t facing it? That might be the case, but nevertheless, there you will be. Molly Ringwald mines the complexities of modern relationships in this gripping and nuanced collection of interlinked stories. Writing with a deep compassion for human imperfection, Ringwald follows a Los Angeles family and their friends and neighbors while they negotiate the hazardous terrain of everyday life–revealing the deceptions, heartbreak, and vulnerability familiar to us all. In “The Harvest Moon,” a stay-at-home mom grapples with age, infertility, and an increasingly distant husband. In “Ursa Minor,” a former children’s television star tries to rebuild his life after being hospitalized for “exhaustion.” An elderly woman mourns the loss of her husband and her estranged relationship with her daughter in “The Little One.” In “My Olivia,” a single mother finds untapped reserves of strength to protect her flamboyant six-year-old son who wishes only to wear dresses and be addressed as Olivia. And in the devastating title story, a betrayed wife chronicles her pain and alienation, leading to an eviscerating denouement. As the lives of these characters converge and diverge in unexpected ways, Ringwald reveals a startling eye for the universality of loss, love, and the search for connection. An unflinching yet poignant examination of the intricacies of the human heart, “When It Happens to You” is an auspicious literary debut. As a fan of Molly Ringwald’s acting work in movies such as The Breakfast Club, Pretty in Pink and Sixteen Candles, when I popped into my local store and spotted When it Happens to You I was intrigued as to what her writing work would be like. I was not disappointed. When it Happens to You is an enjoyable, profound character-based narrative, exploring morals and betrayal of love and emotion. When it Happens to You provides examples of people’s real life troubles in everyday life. It explores emotions and reactions, as well as a chance to view the situation by different perspectives which allows the reader to empathise with many of the characters. Molly Ringwald has certainly mentally placed herself in the shoes of each character, discovering their personality, flaws and reactions. Many readers may have experienced one or more of the ordeals that the characters are experiencing themselves or will know of someone who has. It is because of this that makes it so easy to relate and connect with the characters and their story. The reader can begin to understand how an unfaithful partner, an act of betrayal, can affect their partner’s life, their child’s life and their own life, as well as the lives of their friends, families, neighbours and new acquaintances they may meet. When it Happens to You is made up of short stories based on each of the characters and the events that are taking place in their lives and how they respond and feel about them. Each short story centres strongly around that particular character, however as the reader goes from one story to another it becomes obvious that the book as a whole can be read fluid-like through each chapter and has a strong current running through all of them which allows the reader to see the bigger picture as well as the individual one. The stories are all connected, some more subtle than others, and they all share a main theme based on betrayal and different kinds of relationships that people have with others. My favourite short story has to be ‘When it Happens to You’ as it explores every possible mental thought that a hurt, deceived individual would think. It asks all the questions, no matter how insane they sound and goes on to reveal how priorities are mixed up and how one loses all sense of logic when in this dark, lonely place. For example, regardless of all global troubles, natural disasters and tragedies, etc, the mind will focus on the one hurt that affects them personally. There is a great deal of powerful description, language and feeling in this one particular story. I felt that this was the core of the book and could have used the whole chapter as a quote, however this would certainly spoil the book for any future reader. The strength and emotive power that takes over the audience when watching Molly Ringwald in character in her movies are all too apparent in her writing also. Emotions run high, there are scenes that can bring on tears, whilst around the corner Molly provides the characters (and the reader) with hope and opportunity. Aside from the novel itself, the reader is also provided with two fantastic features in the book once the story has been read. Firstly, there is a section About the Author ‘Meet Molly Ringwald’ which provides the reader with background knowledge of Molly Ringwald’s career. This is followed by About the Book ‘A Conversation with Molly Ringwald’ where the reader is able to discover ideas and main themes of the individual short stories, as well as the book as a whole and what holds it all together. Although I found this to be fascinating to read as it breaks up the emotions and parts of the story even more, the story speaks strongly for itself and requires no clarification. It is an absolutely captivating read!! 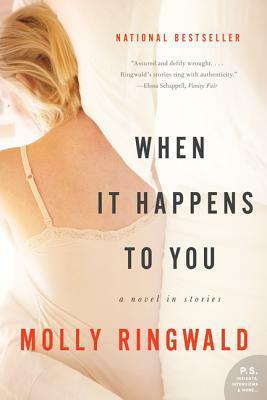 Molly Ringwald’s ‘When it Happens to You is available on Amazon US and Amazon UK in hardback, paperback and Kindle editions.